I tried two new recipes for Thanksgiving this year. I love using phyllo dough cups since they are so easy and perfect for bite-sized appetizers. I thought I was bringing cranberry sauce, but turns out that dish was already taken. Since I already bought the berries, I coated them in sugar and added them to a sweet potato tartlet recipe that I found. They were so pretty and really added a lot of flavor! Plus, the original recipe topped the tartlets with brown sugar pecans, but I absolutely love Trader Joe’s sweet & spicy pecans since they have a kick to them, so I used them instead. In addition to the tartlets, I brought iced tea (I’m pregnant so no wine for me this year). We have a lot of rosemary growing in our backyard so I threw that into the tea with some peaches and a ginger simple syrup. The tea was really tasty but I should have given myself more time to make it. I put the hot water into my drink dispenser to brew the green tea but the heat ruined the seal so it started leaking. Luckily my grandma had a backup dispenser that we transferred it to when we got there. Hope you all had a wonderful holiday and got to spend quality time with your loved ones! 1. Wash the sweet potato, stab holes in it, rub in olive oil, wrap in aluminum foil, then cook in the crock pot for 8 hours on low or 4 hours on high (or cook the sweet potato by your preferred method). 2. Preheat oven to 350 degrees. Place shells on baking sheets. 3. In a food processor or with a mixer, blend cream cheese and sugar until smooth. Add sweet potato (no skin), sour cream, egg, and vanilla. Spoon filling into shells. 4. Bake at 350 for 15 minutes or until center is set. While still warm, press on pecans. 5. Once cooled, garnish with mint leaves and sugared cranberries. 1. In a medium saucepan, heat water and 1 cup sugar over medium heat until boiling. Keep just at a boil for 10 minutes or until it thickens slightly. 2. Allow to cool for 15 minutes. 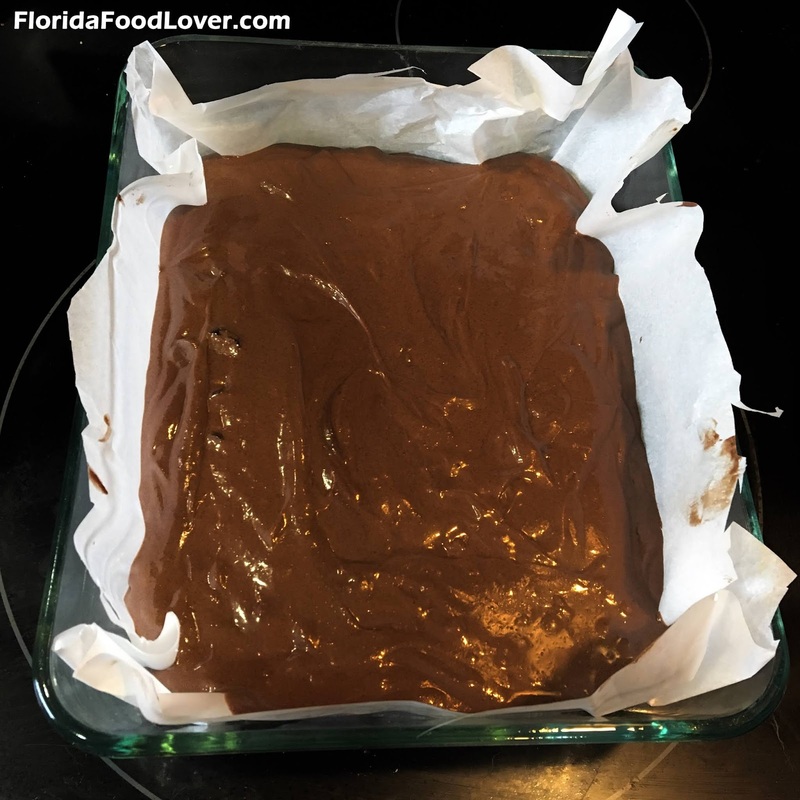 Line a cookie sheet with foil and place a cooling rack over. Toss batches of cranberries in the simple syrup and transfer to the rack to dry (try to space the berries out so they don’t stick together). 3. Allow to dry for 30-45 minutes, then toss the berries in the remaining 1 cup of sugar. 1. Add tea bags and rosemary to a pitcher and top with boiling water. Allow to steep for 6-8 minutes depending on how strong you like your tea. 2. Remove the tea bags and allow the tea to cool. 3. Meanwhile, boil 1 cup water, 1 cup sugar, and ginger in a small pot over high heat. Reduce heat to medium then allow to simmer uncovered until the syrup thickens Remove from heat and allow to cool. 4. Fill a drink dispenser part way with ice. Top with sliced peaches, cranberries, rosemary iced tea, and ginger simple syrup. This is probably the best (and most unhealthy) way to eat cauliflower. It tastes like bites of fried chicken but is completely vegetarian. These would also be delicious served over a salad, but we devoured them on their own. 3. Dredge cauliflower pieces in flower, dip into eggs, then dredge in Panko mixture, pressing to coat. 4. Add cauliflower to the skillet 8-10 at a time and cook until evenly golden and crispy, rotating every minute (they should crisp up in 2-3 minutes). 5. Transfer to a paper towel lined plate. 6. Toss the fried cauliflower in Soyaki sauce and serve. Buzzfeed recently posted a video ranking different celebrity brownie recipes. This one by Gordon Ramsay is sprinkled in Pop Rocks (or as he calls them, “popping candy.” We tried this recipe out for a pre-Fourth of July BBQ over the weekend. I have to say, I followed the recipe and mine did NOT turn out as expected. 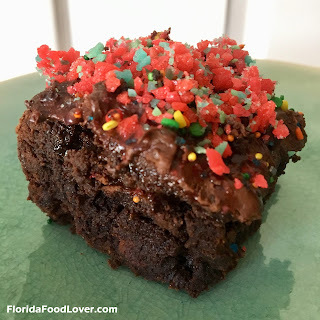 The brownies were so thick that the inside wasn’t cooking so it was liquid inside at the end of the cooking time. Also, it recommended lining the pan with parchment paper, which ended up being more of a hassle than just spraying the pan like I normally do. I was ready to call it a Pinstrosity, but after cooking them for a bit longer and hiding all the crevices in sprinkles and Pop Rocks, they weren’t nearly as horrible looking. 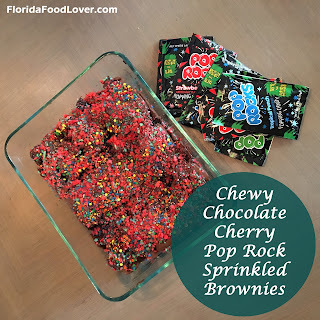 In addition to Pop Rocks, the brownies have dried cherries inside giving them a Black-Forest Cake flavor. It was kind of a strange combination; I think I’d try the same base recipe but with toasted coconut or nuts on top next time. If you do end up using Pop Rocks, make sure to wait for the brownies to cool and sprinkle them right before serving, otherwise they may end up melting and losing their pop. Also, I got red and blue Pop Rocks for Fourth of July, however, be warned that the color on the packages does not match the color inside. The green package is actually red watermelon inside and the blue package is green tropical punch (the strawberry was the only predictable color). 2. Beat butter and sugar together until light and fluffy. 3. Melt 2/3 of the chocolate chips. I put mine in the microwave and heated on 30 second increments while stirring until liquid. 4. 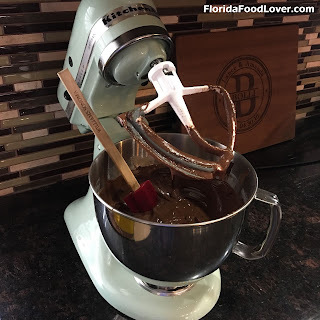 Pour the chocolate into the butter mixture and combine. 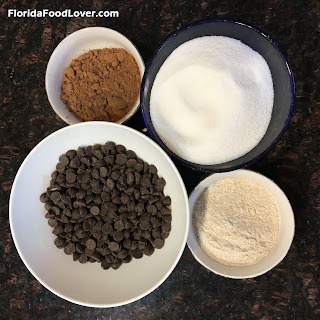 Add the flour, salt, vanilla extract, and cocoa powder and mix together. 5. Crack the eggs into a separate bowl and beat with a fork until well mixed. 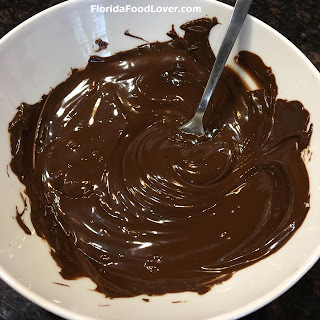 Stir the eggs into the chocolate mixture. 6. Stir in the sour cherries and remaining chocolate chips. If the mixture feels stiff, loosen it with a few tablespoons of milk. 7. Pour the mixture into the pan and bake for 40-45 minutes or until the brownies are coming away from the side. 8. Take the brownies out of the oven and leave to cool. 9. 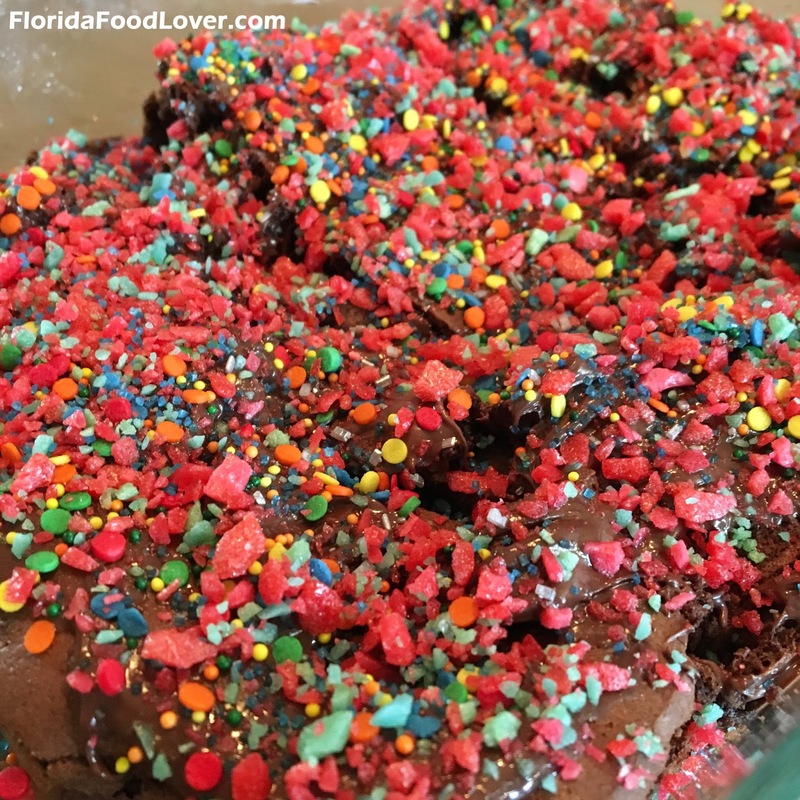 When cooled and ready to serve, sprinkle with Pop Rocks and sprinkles. 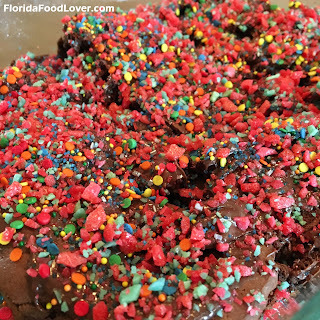 *We tried to use more melted chocolate as a frosting, which tasted good but caused the Pop Rocks to melt. If you use them as a topping, they shouldn’t touch anything liquid to remain intact. The hardest part of this recipe was actually finding cannoli shells that weren’t already filled. I’m sure if I drove to a specialty market or bakery, it would have worked out fine, but I was on the hunt late at night and ended up at 4 grocery stores before I found them (none at Trader Joes or Sprouts, Publix wouldn’t sell them empty since they didn’t have a SKU for them, so I ended up at Whole Foods). This cheesecake uses ricotta instead of cream cheese and is topped with a layer of cannoli filling, pistachios, Trader Joe’s candied orange slices, and couple cannoli for decoration. We had a family potluck at our house with 16 people this year – all the food was delicious but I especially loved my mom’s cute chick deviled eggs! We had plenty of leftovers because there was so much food. Plus, my grandpa brought a Goody Goody strawberry pie for dessert so we had lots of sweets. 4. Combine all crust ingredients together and press evenly into the bottom of the pan and ½” up the sides of the pan. Bake for 10 minutes and allow to cool before filling. 5. In a large bowl or stand mixer, beat the 2 cups of ricotta and granulated sugar until smooth. Beat in flour, vanilla, orange peel, and orange juice. Add beaten eggs, one at a time, and blend on low speed until just incorporated. 6. 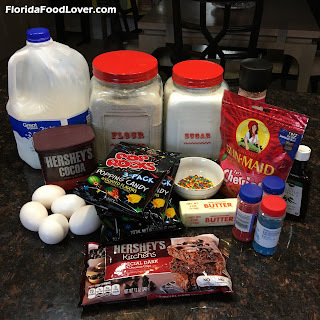 Sprinkle chocolate chips with flour (to keep them from settling to the bottom of the pan). Sift out the flour and add the chips to filling. Mix gently and pour into the prepared pan. 7. Fill a large baking pan with 1” hot water. 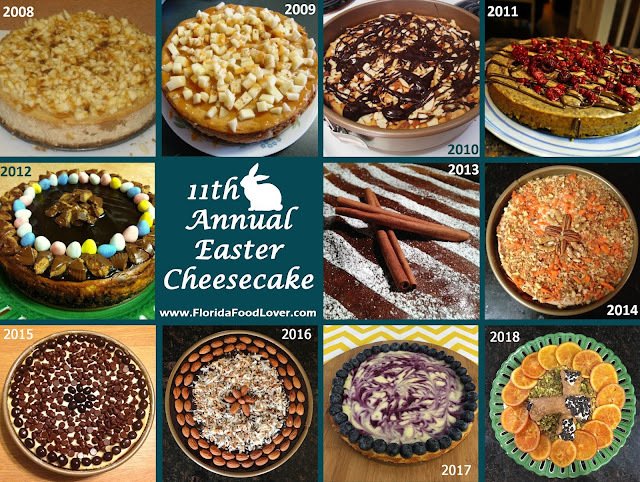 Place the springform cheesecake pan into the baking pan and bake for 75 minutes, or until center is almost set. 8. Carefully remove the pan from the oven and place the springform pan on a wire rack to cool for 10 minutes. 9. Run a sharp knife around the edges of the pan to loosen. Let cool for an additional hour then remove the pan. Refrigerate for several hours or overnight. 10. For the cannoli filling, combine the ricotta, powdered sugar, vanilla, orange zest, ¾ cup of the chocolate chips, and ¾ cup of the pistachios. 11. Pipe filling into the cannoli shells and dip the ends into the remaining chocolate chips. 12. Spread the remaining cannoli cream over the cheesecake. Arrange the candied orange slices around the edge of the cake, sprinkle the remaining pistachios in the center of the cake, and top with cannoli.